FRANTOI CUTRERA GRAN CRU NOCELLARA DEL BELICE IGP SICILIA: Made exclusively from Nocellara del Belice variety olives hand-harvested from mid-October through November in the areas of Partanna, Campobello de Mazzara and Castelvetrano in western Sicily. This mild intensity oil has aromas of freshly picked tomatoes and fresh vegetables with a subtle bitter finish. 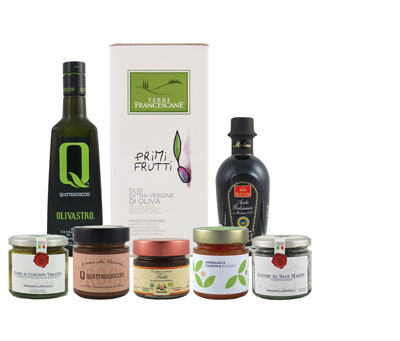 BASIRICO DOP VALLI TRAPANESI: This DOP (Denomination of Protected Origin) certified “Valli Trapanesi” extra virgin olive oil is pressed from hand-picked olives, mostly of the native Cerasuola variety, giving it a slightly more intense flavor. This unfiltered oil is fruity and complex, with aromas of ripe tomato and banana with hints of black pepper, mint and basil. Its flavor is fruity and harmonious with a slight presence of bitterness and pungency and a sweet almond finish. MANDRANOVA CORATINA: Hand-picked in mid-September to the beginning of October, this oil is produced from 100% Coratina olives grown on the Mandranova farm and crushed immediately after harvest. Green with slight golden hues, its aroma is characterized by elegant vegetal notes of artichoke and chicory with hints of almond and rosemary. Its taste is powerful and robust yet balanced in delightful bitterness and pungency. *FRANTOI CUTRERA ORANGE MARMALADE: This delicious citrus marmalade is produced with oranges from the Sicilian province of Agrigento and is particularly rich in Vitamin C, A, B, B3 and minerals. Perfect for breakfast, as a snack and paired with goat or fresh cow’s milk cheeses. Also excellent in cakes and desserts.